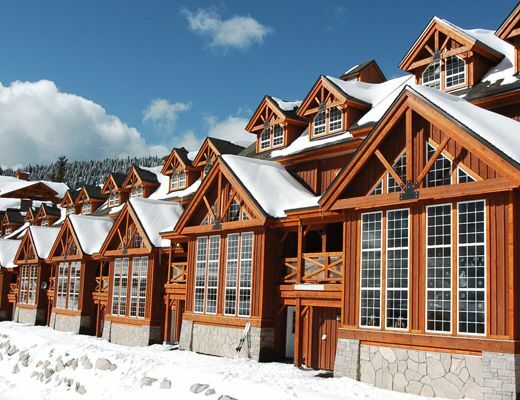 Located in the lower village of Big White Resort and across from Hummingbird Run, this fabulous townhome is beautifully decorated and offers pleasant lodging accommodations for your upcoming mountain vacation. With nearly 2000sq ft. of charming living space, guests are able to settle into the warm and welcoming atmosphere with ease. This delightful rental unit is host to exposed beams, vaulted ceilings, fine finishes, relaxed furnishings and a cozy stone fireplace. The fully-equipped kitchen provides guests with all the comforts of home and boasts impressive tile work, modern appliances, handsome cabinetry and a breakfast bar for informal dining. Unique wood work adds visual interest to the already wonderful alpine-inspired space, enhancing the idyllic rustic notion. The three bedrooms are each dressed in pleasing linens and attractive appointments, creating a sense of tranquility, while the bathrooms are fitted with contemporary fixtures. Ski storage, internet access and a private hot tub are a few extra amenities that await you at Black Bear.